Diagnosing PE — Is V/Q Imaging a Better Choice, Especially for Younger Women? For the past 40 years, physicians have used ventilation/perfusion (V/Q) imaging to diagnose potentially life-threatening pulmonary embolisms (PEs). A nuclear medicine utilizing a gamma camera, V/Q imaging involves injecting both a radioactive tracer and having the patient inhale radioactive gas. If the lungs are working properly, the air flow seen on the ventilation scan will match the blood flow seen on the perfusion scan. A mismatch between the ventilation and perfusion scans (V better than Q) could indicate a blockage or PE. Although V/Q scanning uses radioactive materials, the amount of patient radiation exposure is low. However, over the past 10 years, CT angiography (CTA) has begun replacing V/Q in most medical centers and community hospitals. In many physicians’ minds, CTA is becoming the new gold standard for imaging PE. CT is faster and produces sharper images, which many believe make the results easier to interpret. Also, at most hospitals, a CT scanner is available 24/7, while nuclear medicine technicians needed to perform a V/Q study may not be on call, especially on nights and weekends. Freeman and his colleague, Linda B. Haramati, MD, director of thoracic imaging at Montefiore, have been successful in convincing the cardiothoracic and emergency department (ED) physicians at their institution to consider the possible long-term consequences of radiation exposure from the CT exams and to use V/Q for diagnosing PE when possible. At Montefiore, the physicians use a pretest algorithm to carefully select which patients they send to the CT scanner and which patients they send to the nuclear medicine department when they suspect PE, Freeman says. Paul Cronin, MD, MS, MRCPI, FRCR, an assistant professor and the director of the cardiothoracic radiology fellowship at the University of Michigan Hospitals in Ann Arbor, agrees that V/Q has a role in scanning suspected PE patients with contrast allergies and/or renal impairment and in those with normal chest x-rays. He also agrees that radiation exposure is a concern. However, Cronin still believes that in many cases, multidetector CT (MDCT) is the better choice for diagnosing suspected PE for several reasons, including that MDCT produces results faster, is more accurate, and offers additional diagnostic capabilities. “The speed of MDCT PE imaging means that even ICU patients can be imaged, and these patients are at increased risk of PE,” Cronin says. Also, he adds, radiologists are more likely to have conflicting opinions when interpreting V/Q scans than with CTs. Show two radiologists a CT scan and ask if they see a PE and “they are very likely to independently agree that there is or isn’t a PE. However, there is poor agreement between radiologists in the interpretation of V/Q scintigraphy for PE,” he says. Another of Cronin’s arguments is that CT is better than V/Q at depicting other conditions that clinically mimic PE, such as acute pneumonia, a lung abscess, pleural or pericardial effusion, aortic disease, cardiovascular disease, an esophageal rupture, and malignancy. Confirming the presence of these conditions can direct appropriate treatment, he says. While recognizing the controversy, Freeman and Haramati still argue that given that the outcomes-based results are equivalent and that CT carries with it the concern about additional radiation exposure, it is prudent medicine to triage patients with chest x-rays and favor V/Q scanning, especially for young women, whenever possible. PE is the third most common acute cardiovascular disease; only myocardial infarction and stroke occur more often. According to the American Heart Association, roughly 600,000 PE cases occur in the United States each year, leading to approximately 60,000 deaths, or one in 10 cases. In nearly all instances, the clot forms in the deep veins of the legs, a condition known as deep vein, or venous, thrombosis (DVT). The clot breaks off and travels through the vessels to the lung, where it lodges and can cut off blood and oxygen to a lung segment or, more seriously, a lobe. “The size of the clot will determine where it’s going to lodge,” Freeman says. Causes of the primary disease, DVT, and subsequent PE include immobilization (including riding in a plane or car for long distances), surgery, trauma, obesity, heart disease (such as an arrythmia), and pregnancy, especially after delivery. Symptoms of PE include shortness of breath, chest pain, coughing up blood, fainting, sweating, and an increased heart rate. Treatment typically involves anticoagulant drugs, which help prevent additional clots from forming. However, anticoagulant therapy carries risks, including complications from bleeding, and physicians don’t want to prescribe them unless it’s absolutely necessary, according to Freeman. Initially, Freeman admits, some ED physicians and residents were dubious when he and Haramati suggested triaging patients based on their chest x-ray findings. “But now residents love it and have been very accepting,” he says. In 2006, before the teaching hospital agreed to use Freeman and Haramati’s chest x-ray algorithm for choosing the modality for diagnosing PE, about 60% of PE studies were performed with CT. In 2007, after the new diagnostic algorithm was adopted, about 60% were V/Q studies. “That means the effective dose was reduced by 23% from 11.5 mSv in 2006 to 8.9 mSv in 2007,” says Haramati, who reported the results in April at the American Roentgen Ray Society’s annual meeting in Boston and will have the results copublished in a forthcoming issue of the American Journal of Roentgenology. One reason that CT has become the initial imaging modality in most institutions is because radiologists and their residents are more comfortable with it, according to Freeman. Avi Oppenheimer, MD, a third-year radiology resident at Montefiore, confirms that he prefers CT because if the patient has a PE, “you can see it, and seeing is believing.” However, he says that he understands the concern about radiation dose and has learned to become comfortable sending patients, especially young women, with suspected PE and negative chest x-rays to the V/Q scanner and sparing them the CT radiation. The enhanced training that he has received in V/Q interpretation, which is part of the protocol at Montefiore, has made him both a believer and more comfortable with the nuclear medicine study as well. David Esses, MD, ED director at Montefiore’s Moses Division, says that diagnosing PE has always been a very difficult decision for many physicians to make. “We’ve always had to pick between the CT scan or the V/Q lung scan, and neither of those tests is 100% satisfactory.” However, he says, the medical community has become more conscious of the dangers of radiation exposure in recent years, and if a V/Q scan can produce equal quality results, it makes sense to favor it over CT when circumstances allow. Esses says it is important to consider the likelihood of the patients having a PE when choosing which exam to use. A patient with a low pretest probability is a good candidate for V/Q, while a patient with a high pretest probability may not be, he says. It also helps, Esses says, that at Montefiore, which has one of the busiest EDs in the country, getting a V/Q scan day or night is not an issue. “The nuclear medicine technicians will come in any time of the night to get the scan. That’s important,” he says. The cost of the two exams is only a small part of the equation, since they are similar. At Montefiore, Medicare reimburses $313 for a $1,688 V/Q scan and $399 for a $1,979 contrast CTA of the chest. Some patients are allergic to the contrast used in CT scans and that could be yet another reason to opt for V/Q over CT, Freeman says. “If a person has kidney disease, the CT contrast media can further harm the kidneys,” he says. Still another reason that Freeman favors V/Q is for baseline imaging. Even if the initial diagnosis of PE is made with CTA, he says, it is useful to perform a baseline V/Q scan because if symptoms recur, the V/Q scan will be useful for determining whether the PE is old or new. “This approach avoids the high radiation exposure associated with multiple repeat CTA scans,” he says. Also, a baseline study before initiating anticoagulant therapy in patients with DVT can be quite useful, he says. It has been shown that anywhere from 38% to 50% of patients with DVT have asymptomatic PE. “If the patient with DVT is started on anticoagulants and subsequently develops symptoms of PE, with the V/Q scan, it will be possible to determine if the PE occurred before or after the patient started taking anticoagulants. You would know whether the therapy was adequate or whether the patient might need an inferior vena cava filter placed,” which may be the required treatment if the drug therapy doesn’t work. Freeman says that improvements to V/Q scanning also should make it a better choice for detecting suspected PE in patients with clear chest x-rays. SPECT-VQ, which provides true 3D-imaging, produces even clearer results. This has become standard practice outside the United States since nuclear medicine physicians have had access to Technegas, an agent that allows superb ventilatory SPECT studies comparable in quality to the perfusion scan. (The FDA has yet to approve Technegas for use in the United States.) Freeman says a few of his colleagues have already switched to SPECT with available agents, but he prefers to wait for Technegas to be approved. Freeman says he hopes it will be approved in the coming 12 to 18 months. — Beth W. Orenstein is a freelance medical writer based in Northampton, Pa. She is a regular contributor to Radiology Today. While there is certainly a role for ventilation/perfusion (V/Q) scanning in the assessment of patients with suspected pulmonary embolism (PE), particularly in those with contrast allergies and/or renal impairment and in patients with a normal chest radiograph, CT imaging has many advantages, especially with multidetector CT (MDCT). The increased number of detectors means faster scanning. Scan times range from 18 to 28 seconds on 4-MDCT, to 4 to 6 seconds on 64-MDCT. This allows high-resolution imaging of small pulmonary arteries throughout the entire thorax in a single breathhold, even in dyspneic patients. Patients with PE are often very short of breath. The speed of MDCT PE imaging means that even ICU patients can be imaged, and these patients are at increased risk of PE. CT imaging is a very accurate test for the diagnosis of PE. In the Prospective Investigation of Pulmonary Embolism Diagnosis 2 (PIOPED II), the sensitivity of CT pulmonary angiography (CTPA) for PE was 83% and specificity was 96%. With such a high specificity, if the test is positive, the diagnosis can be ruled in or confirmed. Several papers have reported statistically significant greater accuracy for PE detection for CT with sensitivities and specificities for CT of 83% to 94% and 94% to 96%, respectively vs. 65% and 94% for V/Q scintigraphy. Many believe these results are sufficient justification for CTPA to replace V/Q scintigraphy in the diagnostic algorithm for suspected acute PE. There is considerable interobserver agreement in the interpretation of CT scans (ie, if you show a radiologist a CT study and ask, “Is there a PE?” and show another radiologist the same study and ask, “Is there a PE?”, the two radiologists are very likely to independently agree that there is or isn’t a PE). However, there is poor agreement among radiologists in the interpretation of V/Q scintigraphy for PE, with radiologists more likely to have conflicting opinions than with CT.
Because CT directly visualizes the PE, it is possible to assess the thrombus burden or the amount of clot that is in the pulmonary arteries, which affects the patient’s outcome. It is also possible to decide if the clot is acute or new vs. chronic or old. CT has the ability to depict other conditions that clinically mimic PE, such as acute pneumonia, lung abscess, pleural or pericardial effusion, aortic disease, cardiovascular disease, esophageal rupture, and malignancy. Other conditions have been reported to have been found in 11% to 70% of CT examinations performed for suspected acute PE, and CT is better at depicting other conditions compared with V/Q scintigraphy. In 90% of patients with PE, the source of the clot is the lower extremity veins, or a deep venous thrombosis (DVT). The leg veins are usually assessed with ultrasound, but they can also be assessed with CT. A further advantage of CT is the ability to evaluate the pelvic and abdominal veins not always assessable with ultrasound, specifically the inferior vena cava (IVC), the main vein between the legs and heart. CT can image the leg, pelvis, and abdominal veins, and this can be combined with CTA without requiring any additional intravenous contrast material. However, this does increase radiation dose. Because CT directly visualizes the DVT, it is possible to assess the amount of clot remaining in the leg veins. If this is significant, the patient’s doctor may choose to insert an IVC filter to stop the remaining clot from getting from the leg veins to the heart and lungs. 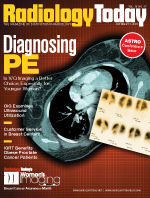 In a recent survey of U.S. imaging practices for diagnosing acute PE, the authors found that 87% of respondents believed that CTPA was the most useful imaging procedure for patients with acute PE. Participants reported that they received indeterminate or inconclusive results 46% of the time for V/Q scintigraphy but only 11% of the time for CTA. With respect to availability, 88% of participants reported that CTA was available around the clock vs. 54% for V/Q scintigraphy, and 69% of respondents reported that they received CTA results in two hours or less vs. 38% for V/Q scintigraphy. CTPA was also reported to provide an alternate diagnosis to PE or showed other significant abnormalities 29% of the time, and these findings frequently altered management. The authors of this study concluded that U.S. clinicians unequivocally prefer CTPA in patients with suspected acute PE. Reasons for this preference included availability and timely reporting, a lower rate of inconclusive results, and the additional diagnostic capabilities that CTA can provide. The prognosis and optimal therapy in patients with PE are strongly influenced by the presence or absence of cardiac compromise. The main cause of death within 30 days of acute PE is (right ventricular) right-sided heart failure. These patients may benefit from intensive therapy with thrombolytic agents, which break down the clot, or surgical removal of the clot (embolectomy) as opposed to anticoagulation therapy. CT directly visualizes the heart and allows the assessment of right-sided heart function, which can help stratify patients with right-sided heart dysfunction and guide therapeutic decisions. PIOPED II is a large, multicenter study funded by the National Heart, Lung, and Blood Institute designed to evaluate the accuracy of MDCT for the diagnosis of PE. The results were published in June 2006. Based on data from the PIOPED II trial, the authors developed recommendations for the diagnostic pathways in acute PE. The choice of diagnostic tests depends on the clinical probability of PE, the patient’s condition, the availability of diagnostic tests, the risks of iodinated contrast material, radiation exposure, and cost. The recommendations are based on probability of having a PE (low, intermediate, or high) on clinical assessment. In patients with a low probability of PE on clinical assessment, a blood test that measures clot breakdown products (a D-dimer test) should be performed. No further testing is required if the D-dimer is normal. If the D-dimer result is positive, CTA is recommended. In patients with an intermediate probability on clinical assessment, the PIOPED II investigators recommend performing a D-dimer test. If the D-dimer result is negative, no further testing is necessary, though leg vein ultrasound could be considered. If the D-dimer result is positive, CTA is recommended. In patients with a high probability clinical assessment, the D-dimer testing need not be performed because a negative D-dimer result in a patient with a high probability clinical assessment may not exclude PE. Treatment with anticoagulants should be given while awaiting the results of diagnostic tests. The PIOPED II investigators recommend CTPA. However, there are issues with CT imaging, one of which is radiation dose, and this needs to be considered when imaging patients. All attempts to minimize radiation dose should be made, including following guidelines as described above and considering tests with lower or no radiation dose, if possible. Another issue is that in some ways CT is too good at identifying PE and may identify small PEs which are then treated but may not need treatment. In summary, CTA has effectively become the de facto first-line imaging test for the evaluation of PE. Patients with a high-quality negative CTA do not require further examination or treatment for suspected PE. We are likely to see further technical developments in CT technology in the near future. These advances will most likely further improve image quality. Several questions or issues remain, including strategies for further imaging when CT is inconclusive or contraindicated, issues regarding radiation exposure, and the question of whether all PE patients need anticoagulation treatment. — Paul Cronin, MD, MS, MRCPI, FRCR, is an assistant professor and the director of the cardiothoracic radiology fellowship at the University of Michigan Hospitals in Ann Arbor.